During the 1930s Oscar Faber struck a balance between practicality, functionality and — with help from architects — aesthetics. One of the best examples of this concerned the interior of a building almost more than its exterior. That building contained the first mechanical and electrical job to establish the reputation of Faber's practice, and was the most significant single achievement in his working life — the rebuilding of the Bank of England (1924-42). The architect George Sampson began building the Bank of England on London's Threadneedle Street in 1732-34. Sir Robert Taylor (1714-88) then extended the façade and added the Rotunda in 1765-88. Sir John Soane (1753-1837), the bank's Architect and Surveyor, completed the original buildings over the period 1788-1833. The ever-increasing volume of work meant that the bank needed much more space (and many more members of staff). Sir Herbert Baker designed a new building that would replace the three-storey complex with one that had seven storeys above ground and three below ground. This included extensive underpinning, installing long retaining walls, conservation of the Soane exterior boundary wall, rebuilding the banking halls in open plan and reconstructing the Soane domes forming the roof of the ground floor banking halls. Faber was consultant for the project, though he relied on Rob Kell for the design of the heating and air conditioning plant and electrical systems, while Jim Vaughan did much of the detailed work on the steel frame and its foundation. The whole team worked well together — helped by the fact that from 1931 Faber, Baker and the heating contractors (Rosser & Russell) all had offices in the same building. The project was important from an environmental perspective as well as for its engineering aspects (mechanical, electrical and civil). To some extent, both Faber and Kell were learning as the job progressed. This was certainly the case with the panel heating — then gaining popularity — where proprietary systems (by Crittall's) used steel or lead pipes to convey the hot water. The two engineers suggested using copper instead, as it has a smoother bore and is easier to bend than steel and, unlike lead, does not distort when hot. The copper pipes were arranged in neat curves over the top of the Soane domes and then encased in concrete. Something that set Faber apart from many of his contemporaries was his awareness of the need for ventilation and heating in large spaces, though there were other heating and ventilating specialists in England before him. Among the most significant were Wilson Weatherley Phipson (1838-91), Dr David Boswell Reid (1803-63) and Arthur Barker (1870-1954). Phipson introduced the Van Hecke system to England and put it to use in many large buildings, including the Royal Albert Hall and the Natural History Museum. Reid was famous for his ventilation schemes for the temporary and new Houses of Commons — the latter designed by Sir Charles Barry (1795-1860). Barker, a contemporary of Faber's, patented a method of radiant heating in 1908 and was President of the Institution of Heating & Ventilating Engineers (IHVE) in 1922. 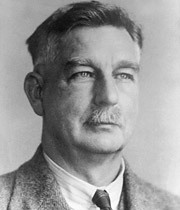 However, it was Faber's work on the Bank of England that distinguished him particularly from other engineers of the day. Perhaps thinking about the possibility of a siege, he had the idea of providing a private generating station within the precincts of the building that was capable of supplying power for all purposes. There would also be an independent water supply from wells bored into the artesian basin under the city. This project is an early example of heat conservation in a large building. As more than half of the bank's volume is below ground, an efficient ventilation and lighting system would be essential. Faber and Kell managed to co-ordinate the generating station with the heating installation so that most of the waste heat could be redistributed throughout the building. Water from the panel heating coils was used as a coolant for the diesel engines. Kell, only 23 years old when the project began, was instrumental in all aspects of the services decisions and was involved in on-site electricity generation, with waste heat recovery. The innovative combination of heating and electrical installation gave Kell the chance he needed to prove himself to Faber. Faber, in turn, was keen to widen his own knowledge and in 1935 they produced a series of articles for the Architects' Journal. The following year these were distilled into Heating and Air Conditioning of Buildings, which became a standard textbook on the subject (its tenth edition was published in 2008). A frequent comment about the new Bank of England, in terms of its architecture, concerns the loss of Soane's building. This is described by Sir Nikolaus Pevsner (1902-83) in his Buildings of England series as "the greatest architectural crime, in the City of London, of the twentieth century". Less often explained is Faber's contribution, both to the bank's internal working and to the preservation of one of the most important parts of the original structure � Soane's boundary wall. Nevertheless, the new Bank of England survived wartime bombing and its deep underground vaults accommodated and protected many workers during air raids. It was a triumph of construction and mechanical engineering, and one that secured Faber's reputation.